Samsung Internet v6.2 is now available for download from our APK page. It’s also live in Galaxy Apps and the Google Play Store. Haven’t got the update yet. But can you shedule the time for night mode, like to start at 20 and end at 08? Just like the blue screen mode? Purchased the premium and its not updated yet…… who do i contact? I needed the file downloaded.. 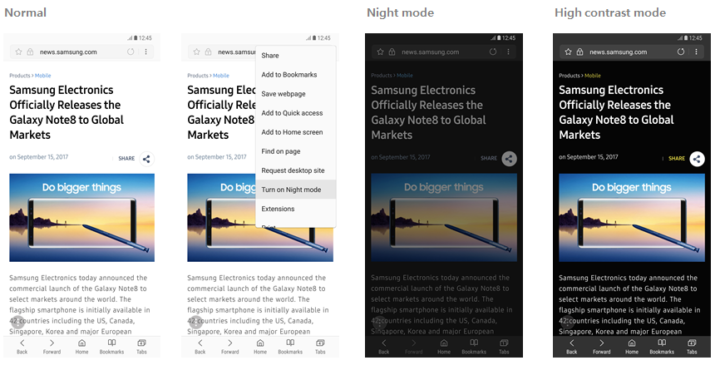 Already got nightmode on 6.0…. @sammobile why you’re not updating apps regularly? Please keep your APK section up to date. It’s available now from our APK page! Where do you find the Samsung Internet 7.0 on S7? I have installed the version 6.2 beta from Play Store and the version 5.4 stable from Galaxy Apps (I don’t find the stable app in the Play Store). Ok, but can you find the stable Samsung Internet on the Play Store? It says that my phone (the Galaxy S7 Edge) is not compatible with the app.